Gloryfying in darkness, Dark Side understands that, like ecstasy, dread arises from a sense that former certainties are mutable. That's why horror texts, which belong to what James Donald has called 'the vulgar sublime,' speak most powerfully in times of unease. I'm sick. So I'm going to let someone else do the writing. 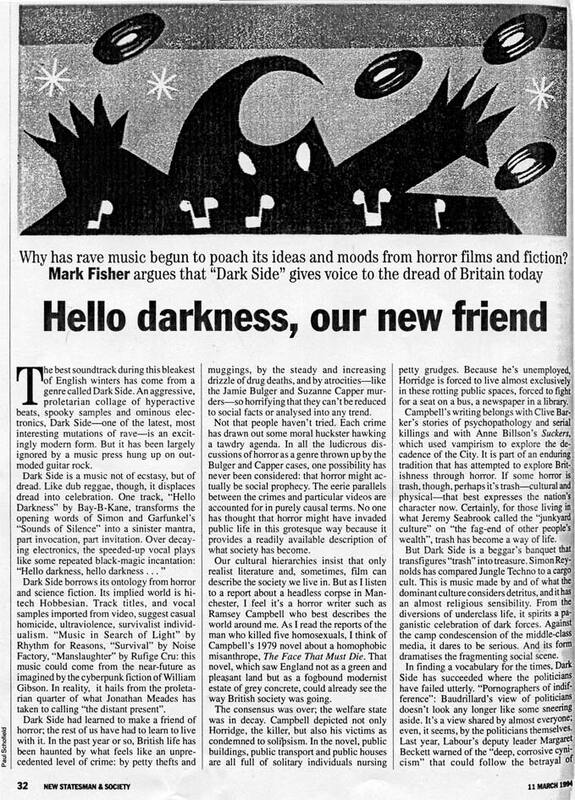 Linked above is a piece on Dark Side written by Mar(k-punk) Fisher for the New Statesman & Society in 1994. Describing Dark's "displace[ment] of dread into celebration," Fisher posits horror as a more apt ontological frame than realism in a society spiraling into violent social decay. Conceptually, this is what I find most compelling about Dark Side - the way it ceded to the morbidity of the era, confronting darkness and celebrating through it, rather than despite it. I'd say America looks ripe for the spawning of its own Dark Side equivalent, but I won't hold my breath (more on that later). For now, at least, old time Darkness remains my soundtrack for the sensory hell that is winter in Ottawa. "For all those who still don't know where they are..."
For me "Hello Darkness" evokes alien logics and those shady creatures sensed but unseen around the edges of psychedelic states. It's like peeking into their carnival of the dark - distorted shadows bouncing in a cathartic marching dance. They chant and scream. Then MC GQ echoes in with an incantation/command. I guess if heard at the AWOL, this might be the moment when hallucination and physical environment would collide and shatter the ego into incommensurable bits. mp3 - Rhythm for Reason "Music in Search of Light"
Er, this song's really good too. Triumph of the Will anyone? mp3 - Third Eye Foundation "No Dove No Covenant"
Sharp redesign and a persuasive DJ Scud review over at Bass Nation. Chantelle Fiddy's comprehensive piece on the new wave of female MCs coming out the UK. Also, intrigued by news via blissblog a few days back, regarding Paul Gilroy's new book Postcolonial Melancholia. In his last one, Against Race, Gilroy briefly discussed rhizomic youth cult interactions in "polyglot urban space." Pointing to Rave, pirate radio, etc., he says "A new style of dissidence is being reproduced in which discrepant forms combine, conflict, and mutate in promiscuous, chaotic patterns which require that the politics of influence, adaptation and assimilation be rethought. Who, after all, is being assimilated into what?" Looks like the new book expands on this fertile line of thought. Apparently it's been a whole month since I last put together a Darkside post. Time to get back at it, I guess. Today's theme: creepy name tunes. mp3 - Johnny Jungle "Johnny"
Founder of of the creepy name sub-genre; co-produced by Frontline/True Playaz artist Pascal and the less prolific Sponge. "Johnny" is another Darkside exploration of claustrophobia and paralytic terror. The gasping vocal hook (apparently pulled from the movie Marked For Death) pleads incessantly over a break that never seems to cut itself loose. Abbreviated hoover loops and clipped atmospherics add to the sense of constraint and confusion. "Scottie" makes my arm hairs stand on end. This version is just a shade less impressive than the original which is a little more sparse and makes better rhythmic use of the "Scottie" sample. Still, it's a brilliant track - utterly creepy with a pummeling Amen mash-up as its foundation. Though the main vocal sample has been attributed to Star Trek (you'll swear it's Kirk) my brief investigation seems to point squarely at the film Evil Dead as the sole source for vocals, screams and menacing giggly creatures. Though comical in one sense the vibe is still heavy, particularly when you consider it in the context of Rave dissolving into paranoia and death obsession. mp3 - Subnation "Scottie (Remix)"
Still, the song itself is only part of the story. It's a good deal more chilling when you hear it in its intended live context, so I'm also posting a clip from an AWOL night at London's Paradise club in 1993. From the sounds of it, this may have been the first time the track was played out live. The tune drops in as the night is winding down - air horns are blaring and it sound like there might be a fight starting somewhere in the room. Then MC GQ and someone from the crowd each yell "We're all gonna die here!" in time with the song which eventually calls back: "We're not gonna die. We're gonna get out of here." In this context, the song plays like a very literal survivalist anthem. Whether AWOL's roughneck mystique was more reality or legend, I'm not sure (sounds pretty friendly in this description), but the vibe contained in this clip is heavy indeed. Two licks of what my be the pinnacle of creepy-name junglism: Remarc's "Ricky." If you've seen John Singleton's Boyz n the Hood you'll recognize the vocal hook. It's from the moment when Tre (Cuba Gooding Jr) watches helplessly - his world suddenly silent and moving in slow motion - as his friend is shot. It's the same sense of paralysis conveyed by a tune like "Johnny." Accordingly, Remarc locks Tre's scream in Gabber-like loops (VIP mix). However, the breaks are all over the place. Whereas Johnny and Scotty were stuck, Ricky's running for his life. The real hair-on-end bits here are the comically slowed down and contorted screams (VIP @ 2:24 and Remix @ 3:25). The VIP Mix contains a cheeky cut-up of Ricky's girlfriend that leaves her saying "I got shot." And tying everything together neatly is Remarc and Lewi's intro to the remix which uses the same "Johnny" sample layered with some timestretched badman threats. mp3 - Remarc "Ricky (VIP Mix)"
From Remarc Unreleased Dubs 94-96 Strongly recommended and currently available to buy on Planet Mu. mp3 - Remarc and Lewi Cifer "Ricky (Ricky and Lewi Remix)"
**Some of the above sample info is borrowed from Jari's 'Drum & Bass sample list' which I highly recommend to any music nerd. Grime, dubstep, sublo, eski, garridge, UKG. Nuff blahblah. It's all Hip House to me. I went to bed planning this post about Goldie, graffiti and teenaged memories of London. "Yes, nice one," I told myself as I dozed off. So I was more than a bit surprised this morning when I found that Spen78 had assembled something remarkably similar while I slept. Scenius at work, innit. This photo is from the May 1991 issue of Hip Hop Connection (the UK equivalent of The Source). I had it for years before I made the connection to Mr. Platinum Breakz himself. Apparently Goldie was quite the aerosol bomber before he started making music. (He was also living in Miami as the Bass scene was taking shape, which is interesting given recent discussions of possible Miami/Ardkore links.) I'm assuming that the piece is named in part for his friend Kemi of Kemistry and Storm - the pair who reputedly introduced him to Fabio and Grooverider's breakbeat experi-mentalism at Rage in 1991. In April 1991, my mom and I went to Britain - Leeds area to see family and London for fun. I was excited about buying music in a real city and sussed out what seemed to be the best spots. The funny thing is that I was looking for American Hip Hop which was practically impossible to find where I lived (an isolated lumber and shipping city a half hour north of the Minnesota border). I remember walking right by a gold mine of 12" 'Dance' vinyl at HMV on Oxford St. - undoubtedly teeming with fresh copies of "Mentasm," "LFO," "Mr Kirk's Nightmare" and all the rest of it. I was interested in Rave at the time, but I had no idea what to look for and, more so, I was on a mission to beef up my collections of Dancehall and Afro-centric Hip Hop. And I did, in spades. Paris, Shabba, X Clan, Gangstarr, Stetsasonic... All great stuff that I wouldn't have found otherwise. But within a couple of months I became aware of just what I'd missed out on. It's still agonizing to think about. Luckily, obsessive trawling of p2p nets helps take the edge off. Now my hard drive is full memories I always wanted but never had. mp3 - X Clan "Heed the Word of the Brother"
So, lesson learned. At the moment, my (soon-to-be) wife and I are tossing around the idea of a trip to London and this time I'll be better prepared. I just need to figure out which Tube line will get me to Rhythm Division. PS: Happy New Year everyone and look out for more Darkside posts (including a Goldie/Rufige installment), a couple of Hip Hop series and maybe a Favela Funk exploration in the coming weeks. Brap!